Looks Good from the Back: Adrien: Please Help Me. How much will I be able to wear it? So, what do you guys think? Keep the trench or return*? I love everything about it, except the 3/4 length sleeves are giving me pause. I don't hate them exactly, but it does sorta give the vibe that the coat doesn't fit. Maybe I just haven't seen enough 3/4 length COATS, so my brain is confused. I love the big pocket and the collar though. Maybe return it and stalk it for clearance? I would return it. 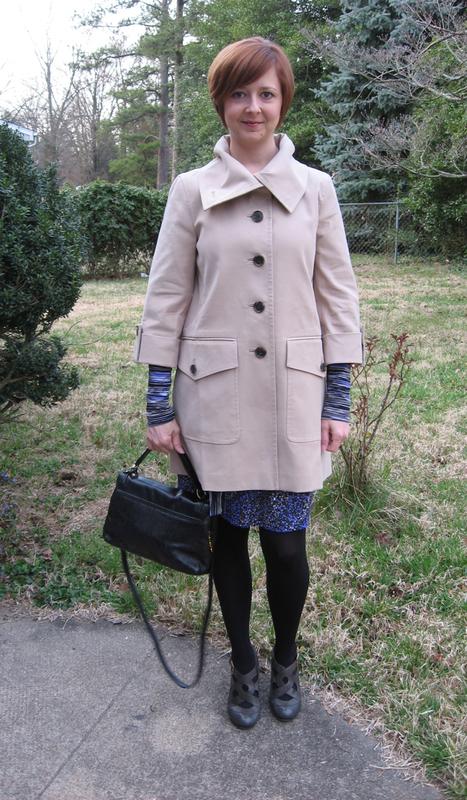 For an 'investment coat', it doesn't add enough ooomph to the overall outfit. I mean, super cute, but if you're wavering, than wait for something you love. Candid, but hopefully welcome feedback here...the color doesn't do much for you. Not many skin tones (including mine) can pull off that color. okay, "I like it" was a weak comment. The collar is great. It looks lovely with your haircut and long neck. It's a trench. The color goes with everyone and everything. The 3/4 sleeves make it special. You could pair it with long gloves in the winter. You can pretty much wear it every day until it gets hot. You have wanted this coat for ages and now you're feeling guilty about money and Japan and god knows what else. I think you would feel the same if you got those shoes you're wanting. Can you wash it? Will is stay looking nice for a looong time? Does it still look as awesome as you remember? I say keep it. I wish this coat was red and had long sleeves and a belt. And smaller pockets. You could fit your cat in there! I vote return it and help Japan. I think it's lovely and it looks fantastic on you. It's also a nice twist from the classic trench. However, I do think the 3/4 sleeves might prevent it from getting worn as much as it should and it's too expensive to just hang in a closet. Save your money for something you really love (or Japan). I vote for return and not because of Japan. I like the sleeves but also wish it had a belt and smaller, preferably slit pockets. It's cute but the 3/4 sleeves give me pause. I also am not crazy about the look of the larger pockets on the bottom. I think you can do better for the price. Return. Thanks, you guys! I really appreciate the honest feedback. It helps! I wish it was red, and with long sleeves. Oh yeah, I'm describing the trench I have. I do like the collar but overall, I think you should return it. 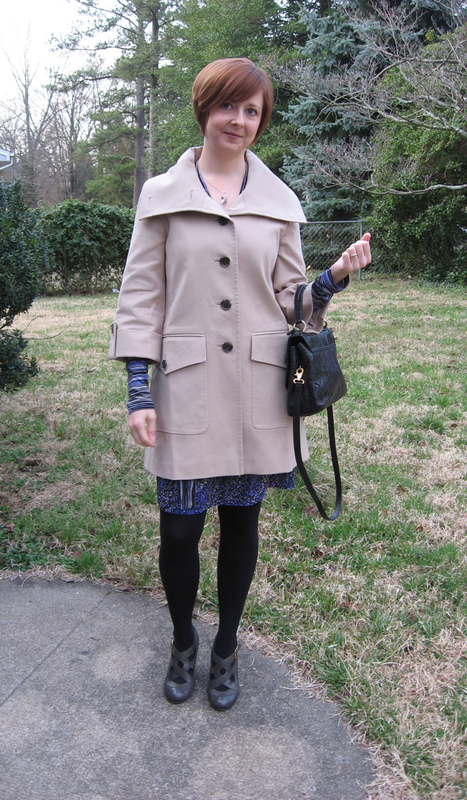 I like the sleeves, but then I own several 3/4 length coats. I love coats. I think the main thing is that you aren't dying to wear it, no matter the price. If you aren't thrilled with it, return it. Clothing should make you happy, IMO. Hmm, I didn't notice the 3/4 length sleeves until you pointed them out and I like the whole effect. I like it. I think it's cute, but just 'cute'. And the sleeves might make it less versatile. I'm not sure if it was 40% off the original price or 40% off the sales price, but it seems a little pricey for what seems more like a novelty trench. Hmmm its hard! I mean, it's a cute coat, but if you don't love love love it then I'd say return it. You want a piece you LOVE, especially when it's a coat. Because then you'll enjoy wearing it all the time!! Hrm. It's not love for me. It's a little boxy I think (maybe that's the point? 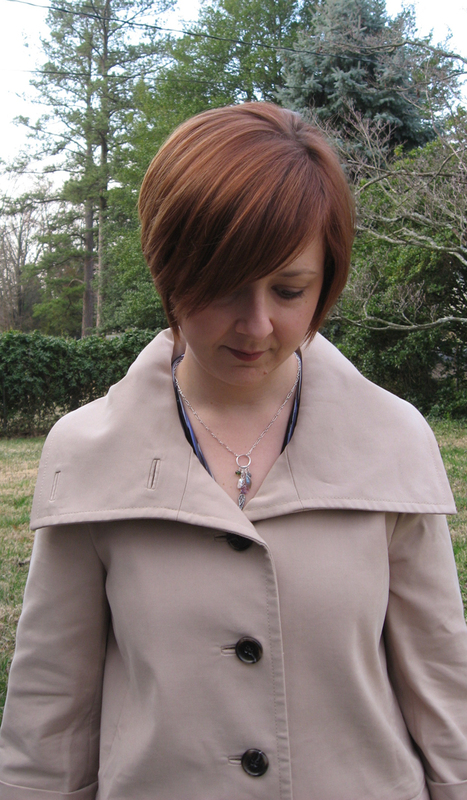 ), plus I have a hate-on for really wide collars, so I'm biased in that department. 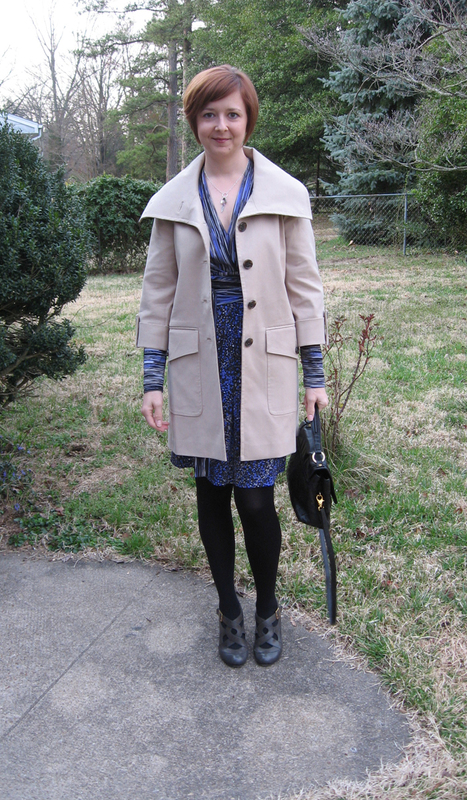 Also, I have a trench that color and I find it difficult to wear - always needs a scarf to liven it up. I'd say invest in something that you feel is really spectacular - that you'll want to wear even when it's really too hot just because it's such perfection. Okay, commenting from vacation across the country to be a voice of dissent, I love it, love it! But not with this outfit. Slim fit pants or a pencil skirt, stripey shirt, scarf, flats, so Parisian, so chic. If you don't love it, get rid of it! And can I say...the DRESS IS ONE OF MY FAVORITES! You look incredible in it. I think the jacket is absolutely fantastic and would be a great piece that can be dressed up or dressed down. 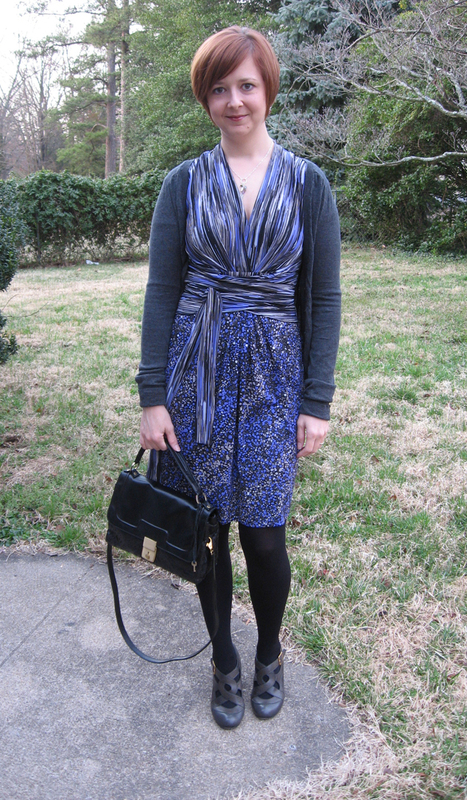 The 3/4 sleeves are awesome too (disclosure: I have a bunch of coats with 3/4 length sleeves). But if you're having doubts, probably a sign to return. 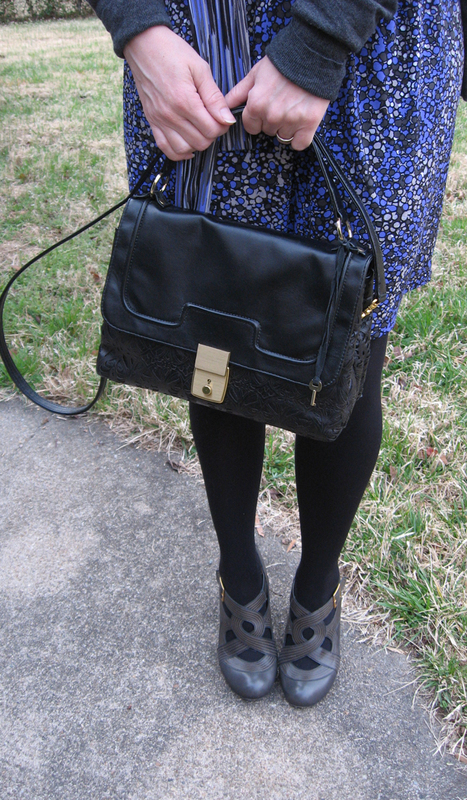 Can't count the number of times I've bought something pretty, and it was only eye candy...never a wardrobe staple. I'm with Marianne -- I think a coat like this requires chic minimalism in the rest of the outfit. And if your closet has more printed dresses than perfectly-tailored crisp white shirts, probably better to return it. I think it's really cute, but probably not very versatile, especially in Richmond where the weather swings from 45 to 85 within a couple of weeks and we get very few cool, mild days. Yes to all of this. I DO love the trench (or I wouldn't have purchased it at all) but I think the kind of outfit I envisioned wearing with it is exactly what Marianne said...which makes it less versatile. If I keep it it really needs to be a staple, something I reach for a lot and I'm just not sure it'll be that. Thanks for all the feedback! I really appreciate it. The color is challenging for fair redheads (such as myself) unless your cheeks are red from running across the moors. I also agree with Marianne, if you are having to re-think the natural funky way you dress 80% of the time, probably best to return the coat. The amazing thing about returning something amazing but not QUITE right is that something even more awesome usually appears in its absence. And you can even still donate to Red Cross!